Whether you're working out or hanging out, you want to bring your iPod along for the ride. The DLO Action Jacket is the all-in-one solution for protecting your iPod nano. With protective neoprene, a rotating belt clip, and an adjustable armband, the Action Jacket is the case that's as versatile as you are. 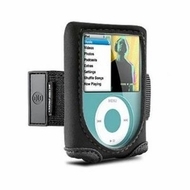 The Action Jacket is a padded neoprene case that protects your iPod nano in style. The crystal-clear window protects your iPod nano screen while still giving you complete control over your music and videos. With multiple colors to choose from, you can select the case that best complements your iPod and your style. Perfect for the gym, running or other activities, the slender armband easily adjusts to fit comfortably on arms from toothpick to python. It's the hands-free way to enjoy your workout soundtrack--cue up a playlist, tune out the rest of the world, and take your workout to the next level with the Action Jacket. The Action Jacket also features a sturdy, rotating belt clip that secures your iPod nano wherever you need to clip it--a belt, a shirt pocket, even a backpack--whatever makes your life easier. With 180 degrees of rotation, controlling your iPod nano while protected in the Action Jacket is effortless and intuitive. Why waste money on multiple cases when one simple solution accomplishes everything you need? The DLO Action Jacket for iPod nano goes that extra mile, right along with you.